A disclaimer: portions of this review will be in some cases just plain vague. 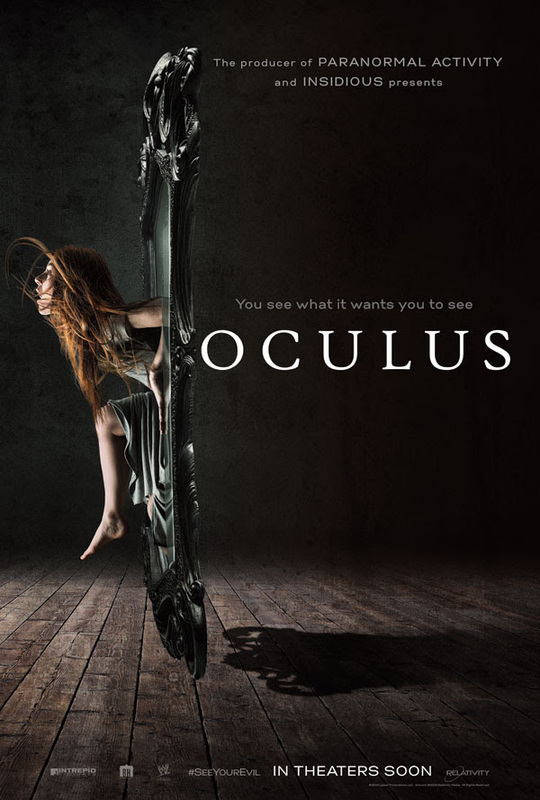 An odd, crafty film such as Oculus must always provide a reviewer with these challenges sadly, as its plot structure holds twists and turns that are just too ingenious to spoil. Familiar pitfalls abound, so don’t get too excited. No actors are winning Oscars here, and the narrative structure is undeniably lopsided. But the laser-focused direction and relentless tone of dread make this one of the most fascinating, disturbing horror films of recent years. Oculus flips between two time periods, following siblings Tim Russell (Garrett Ryan as the younger, Brenton Thwaites as the older) and Kaylie Russell (Annalise Basso as the younger, Karen Gillan as the older). A traumatizing experience in 2002 destroys the lives of both, putting Kaylie into foster care and Tim into a psychiatric facility. Eleven years later, Tim is released and Kaylie has sought him out so that they can crack the truth about the horrors that destroyed their family, not to mention their parents Marie and Alan (Katee Sackhoff and Rory Cochrane). While Tim has spent his years coming to terms with the terrifying events of his childhood, Kaylie has let her bad memories fester and will not rest until she finds peace. But this will not happen for her until she and her brother can record proof of what she believes to be an evil spirit living inside an old mirror that their family once owned, a spirit Kaylie is convinced caused the horrific events of more than a decade ago and must be destroyed. Let’s get the bad news out of the way first: the first act of this movie is pretty bad. The attempts at character development come across as flat and underwritten for the most part, even considering the intriguing backstories. The older Tim and Kaylie never really click with one another until the stakes heighten, partly because they spend a lot of time chewing scenery with their quirky, disturbed characters. But in addition, writers Mike Flanagan and Jeff Howard’s dialogue never really rings true and in some cases just seems plain odd. In particular, a scene where Kaylie and Tim return to the family house after his release lasts about ten whole minutes and consists of nothing but exposition with a capital “E”. The “rules of the game” for capturing a spirit on camera last an eternity, not to mention these rules seem overly and unnecessarily elaborate and embellished. The ensemble delivers decent work across the board, though nothing exceptional. Basso and Ryan give the strongest performances, the two perfectly capturing the terror and tragedy of their young characters’ stories. Gillan unfortunately has been straddled with a tough sell role, delivering the toughest (and in some cases roughest) dialogue. Her efforts to mask her dissipating composure occasionally make her come across as wooden and awkward. Thwaites has similar challenges, his character being handed the short end of the stick where development is concerned. Now for the good news. Once it reveals itself, the premise is nothing short of intriguing. The usage of perspective and memory within the script shows bright spots of brilliance following the clunky opening. Even the dialogue seems newly enlightened and natural, valuing silence and tension much more than before. From a filmmaking perspective, director Mike Flanagan’s smart, purposeful decisions provide the most excitement. He creates seemingly formulaic, near cliché choices as far as horror films go (all possible examples are spoilers, unfortunately) and then turns them on their heads in sly, understated manners. As a result, what seems to be your run-of-the-mill ghost story soon develops into something completely different and undeniably fascinating. The slow transition between moods is so deftly handled and well-paced by the promising director. Flanagan shows incredible skill with his treatment of the dual time settings as well. Sharp, intelligent editing makes the characters seem as if they never really know what time period they are experiencing themselves. Flanagan’s staging and lighting borders on theatrical, which works incredibly well for sucking the audience into the nightmare with Tim and Kaylie. He steals a page right from the Kubrick handbook (there is SO much Shining influence in this movie already, he might as well) and trades in quick, high voltage scares for slow builds in tension as well as a consistently disturbing tone throughout the second and third acts. So much of this film deserves attention and admiration that the jumbled first act can almost be forgiven. Daring, crafty choices from director Flanagan and a smart premise should not go underappreciated. Would the film have benefitted from more consistency? Without a doubt. But push through thirty minutes of mundane for an hour of creepy. You won’t regret the effort.